Brother/Sisters : Bhai Sahib had two Sisters, Bibi Amarjit Kaur (widow), Bibi Swarnjit Kaur and two Brothers, Bhai Harjinderpal Kumar, Bhai Harjit Kumar. Bhai Sahib punishing many looters and black cats that were on the Indian government payroll. By 5pm Bhai Sahib and Bhai Sukhpal Singh Pala had attained shaheedi fighting the Indian security forces. Comrade Baldeep Kumar was part of the student union when he was studying his BA at Nehru College of Mansa. Bhai Sahib was a man that got on with everybody for a good cause. Bhai Sahib had been getting annoyed with the treatment of the general public by the Indian government and his comrade thinking was non-beneficial to the cause of humanity. Bhai Sahib had read a lot of the Babbars history. One day Bhai Sahib sat down with the singhs of Babbar Khalsa, Bhai Balwinder Singh Ganga Babbar, Bhai Sulakhan Singh and Bhai Jaswinder Singh Jassi. Bhai Sahib started a lengthy discussion with the singhs of Babbar Khalsa, in this discussion the comrade ideology was up against the Sikh ideology of Guru Nanak Dev Ji. Towards the end of the discussion, Bhai Sahib had put up his hands and gave in to the singhs of Guru Nanak Dev Ji. After this Bhai Sahib became good friends with the singhs of Babbar Khalsa. Soon Bhai Sahib went to a historical gurudwara of Guru Gobind Singh Ji in Bathinda and took amrit from the Panj Pyare of Akhand Kirtani Jatha. Now Comrade Baldeep Kumar became Bhai Baldeep Singh Babbar. Bhai Sahib joined Babbar Khalsa and with his AK56, Bhai Sahib started doing actions with the singhs of Babbar Khalsa. Bhai Baldeep Singh Babbar was from Punjabi-Hindu family of village Ful, district Bathinda. Bhai Sahib was born in the house of Harbans Lal Sharma and from the womb of Mata Balwant Kaur in 1962. Bhai Sahib had two sisters, Bibi Amarjit Kaur (widow), Bibi Swarnjit Kaur and two brothers, Bhai Harjinderpal Kumar, Bhai Harjit Kumar. Bhai Sahib’s sister, Bibi Amarjit Kaur was married to Dr Tejinderpal, from the neighbouring village to Fol. Bhai Tejinderpal passed away leaving behind three children and after the death of her husband, Bibi Amarjit Kaur moved back to her home in Fol with her brothers. Bhai Sahib’ father, Harbans Lal Sharma now was struggling to provide food for his family including his daughter and her three children, he was not making enough money from the herbal medicine business. Bhai Sahib studied up till 10th class at local school of Fol. Bhai Sahib passed each class at first or second number. Bhai Sahib was tall with a muscular build and had small sharp eyes. Bhai Sahib looked incredibly handsome in his Ponchvi turban, he was a great thinker and didn’t talk much. Bhai Sahib would ask his father many questions. From childhood Bhai Sahib was cleverer than his class fellows. Bhai Sahib had a colourful teen life, singing songs dancing and always staying happy. Bhai Sahib never sang dirty songs or Bollywood songs, in fact when Bhai Sahib would sing songs of warriors and shaheeds. Close family friends started thinking that the young Baldeep was always happy and now in his teenage he is always serious. Bhai Sahib never tolerated rude behavior and neither did Bhai Sahib treat anyone in a bad manner. “Don’t worry, this man is my father. He has the right to slap me”. Bhai Sahib took his father to the canteen and after giving his father a cup of tea, Bhai Sahib told his father, “Father, you can beat me or do whatever you want to me, but I have made my mind up after careful considerate thinking to join the Punjab Student Union, I can’t leave the struggle”. Bhai Sahib’s father spent about an hour with his son and at the end he told Bhai Sahib, “It’s your decision, I’m going home”. Harbans Lal Sharma was not happy about leaving his son behind and when he got home, Bhai Sahib’s brother tried to occupy his father in to household work. After Bhai Sahib had left home, the whole house had lost its liveliness, especially Harbans Lal Sharma started being quiet. Since passing 10th class Bhai Sahib had been losing interest at home and also to his family. When Bhai Sahib had passed his exams for BA, he had started to understand the Sikh Freedom Movement a lot better. 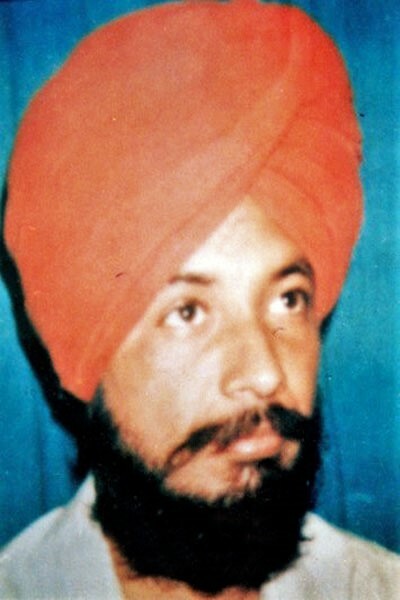 First Bhai Sahib met Dr Gurmail Singh, who was wanted by the police for the murder of Harchand Longowal. Both singhs had stayed together in Mansa in a rented room close to a local police station. One day both singhs were travelling on a scooter, as they passed a police checkpoint they were ordered to stop by the police. The singhs ignored the police and took their scooter straight through the checkpoint but after a lengthy chase the police managed to arrest the singhs. Bhai Sahib was tortured for many weeks and after sent Bathinda jail, while Dr Gurmail Singh was handed over to the Sangrur police. Bhai Sahib’s father told us, “The first time I went to meet Baldeep with his mother, we had tears in our eyes seeing our son behind bars. I couldn’t say anything to him and kept on starring at Baldeep”. After a year in Bathinda jail, Bhai Sahib was granted bail. While in jail, the Punjab Student Union helped Bhai Sahib pass his first exam in MA. Upon being released the police did not allow Bhai Sahib to live in peace at home. Bhai Sahib had started a course of insurance business in Chandigarh and soon started working as an inspector of an insurance company. “Get Baldeep and bring him to us”. Soon a black cat of the police had Bhai Sahib arrested from the Bathinda bypass. The singhs Babbar Khalsa found out about the address and told Bhai Sahib’s family to bail Bhai Sahib before it’s too late. Harbans Lal Sharma took out loans and bribed many police officers to give information on Bhai Sahib, but the police officers took the money but did not give any information to the family. A month after the family found out that Bhai Sahib was being kept and tortured at a thermal plant of Bathinda. Inspector Kundal had charged Bhai Sahib with possession of a pistol and attempted murder, Bhai Sahib was then sent to Bathinda jail. Few months after Bhai Sahib was transferred to Sangrur jail and after 3 months here Bhai Sahib was granted bail. “Mother, the police will not leave me alone, now I’m leaving home. Please forgive me for my mistakes and don’t shed a single tear on my shaheedi instead be proud”. After saying goodbye to his mother, Bhai Sahib left home and started punishing the anti-Sikh elements with the singhs of Babbar Khalsa. Bhai Sahib did not let any Hindu brother leave their homes in fear of racial attacks, instead Bhai Sahib assured them safety. Bhai Sahib punishing many looters and black cats that were on the Indian government payroll. People that say these Khadku Singhs were looters and murderers, no way can they be religious, a request to those people is to go to the houses of these Khadku Singhs and see the state of the house and their families. These families are not rich, in fact they are rich in the currency of meditation upon the name of the true lord, Waheguru. Bhai Sahib had been staying with another singh of Babbar Khalsa, Bhai Sukhpal Singh Pala of Ram Tirath. The police surrounded the whole village of Ram Tirath after an informant had given the police information of the location. 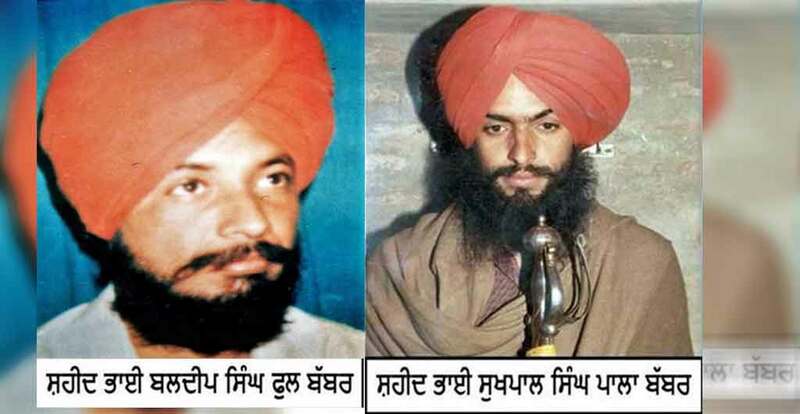 It was about midday the Punjab police and CRP started an intense encounter with Bhai Sahib and Bhai Sukhpal Singh Pala . By 5pm Bhai Sahib and Bhai Sukhpal Singh Pala had attained shaheedi fighting the Indian security forces. The CRP had been collecting the dead bodies of their fellow soldiers till the next day. Harbans Lal Sharma told us, “We heard the news of his shaheedi by half 7 on the evening of 8th August 1992, I mounted myself against the wall and cried for many hours”. (Bhai Sahib Father) Harbans Lal Sharma did not eat for Many days and also did Not Speak. The next day police came to collect Bhai Sahib’s father, Harbans Lal Sharma, so the police can identify the shaheeds. Harbans Lal Sharma told us, “I took my neighbour, Sardar Puran Singh with me to the police station. After doing paper work the police took us to the morgue of Bathinda hospital. About 15-18 police officers took me into the morgue to identify my son. On the floor of the morgue there were about 7-8 dead bodies of singhs with their hair all open, their turbans and Kachera were all covered in blood. There was so much blood on the floor, I didn’t have a space to step on. My Baldeep’s body was on a bench, his face and chest were completely shot with bullets. His hair were hanging down from the bench, he had been wearing a grape coloured kurta pyjama. Next to his body was a light colored turban. There was a time when I held my son Baldeep in my laps, played with him, beat him, loved him a lot and listened to his thoughts as well as reading them too, now my son has left his family and living in peace. My son attained shaheedi fighting thousands of cowardly Indian security forces personnel. I cleaned his face and gathered his hair to put his turban back on his head”. After Harbans Lal Sharma stood against the wall and cried for his son, Shaheed Bhai Baldeep Singh Ful Babbar. The civil clothed police officers took Harbans Lal Sharma outside, when he asked to take the body of Bhai Sahib home the police denied his request. Bodies of both singhs were kept at Talwandi Sabho police station.